Your creativity is the limit...anything that will go through the postal system works. A photograph (taken by you) and printed on a card; a drawing, painting, or collage; an erasure poem; an existing postcard altered in some way. We had the month of April to complete the assignment and send out the postcards. I managed to get them mailed in time, so, I hope the recipients have received them by now. Illustrated poems © Diane Mayr, all rights reserved. You may have seen that cat photo before, it's my indoor cat, Skippy. I've used it with other poems, however, I altered the photo significantly, so it doesn't look exactly like the other illustrations. 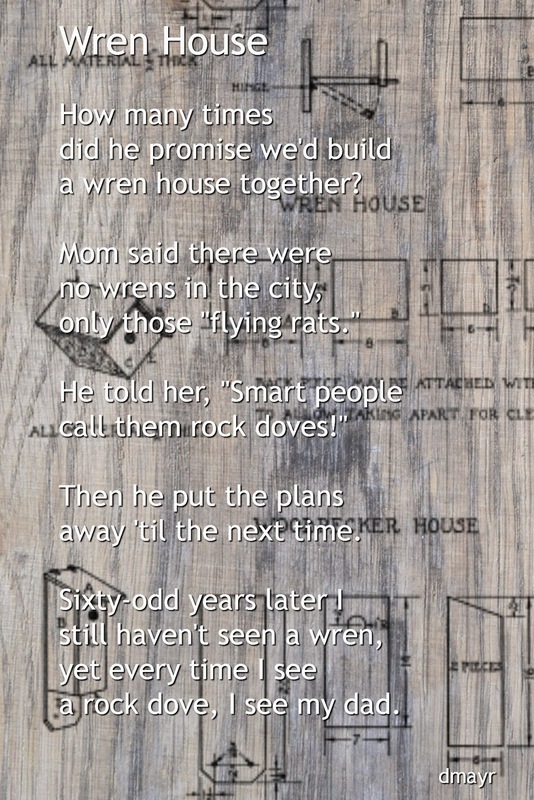 The other three poems I illustrated using public domain images. Don't forget the Poetry Friday Round-Up is being hosted this week by Sylvia at Poetry for Children. Be sure to come back next week when I'll be sharing my Massachusetts Poetry Festival experiences of last weekend-- that is, if I can read my notes! 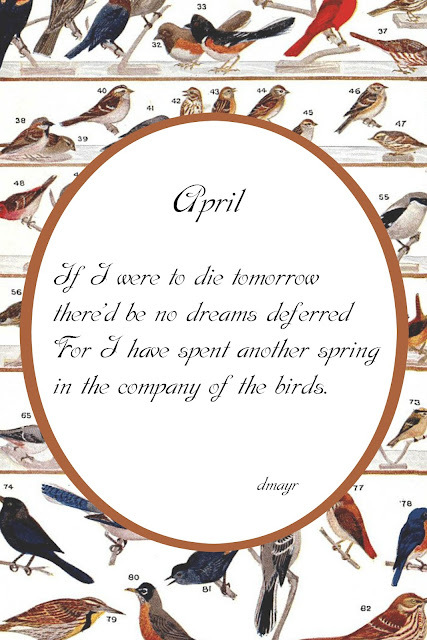 I love these poems, Diane...but "April" sings to me especially sweetly. What a fun project and you have really put your heart and soul into it. Wonderful poems and images. We have cardinals here that will not stop signing. I love catching a flash of red out of the corner of my eye! Wonderful! "April" really hits the mark for me. Wait a minute, is this the same anti-outdoors Andy I know? Love these, Diane. Skippy is adorable and you've done a lovely job with the avian theme in all the poetry postcards. I'm especially loving "April" today, as a charming hummingbird kept me company yesterday at the dining room window (and I don't even have a feeder up). Thanks, Irene, I combined a little Emily Dickinson with a little Langston Hughes. These were all beautiful, Diane. Don't think I could pick my favorite... though the cat one sure is a familiar pose in our house! That could easily be our Noah! Even a window on a gloomy day is a treat for a cat! I imagine that the recipients will have wonderful surprises in their mailboxes, Diane. I had to go to an appointment very early this am, at sunrise, so every time I stopped at a light, or drove through a neighborhood, with the window open, the robins chirped away, just as your poem told us. Lovely! Yesterday, I received the last of four postcards I was sent and was surprised by every one. Four different styles in four different medias. 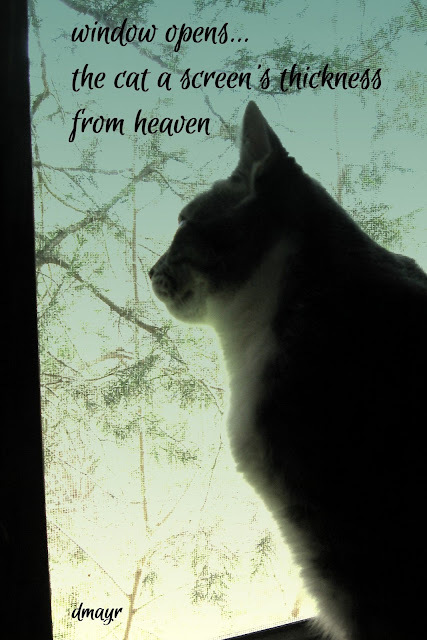 Such familiarity in all your poems, but I especially love the cat haiku! Thanks, Matt! Are you enjoying this week's rain? I'm so glad that May is finally here. Beautiful thoughts and pictures. Thank you for the refreshing pause. I love May, too! All those May flowers! Love these, Diane, especially April! "April" does seem to have its appeal! I love this project! 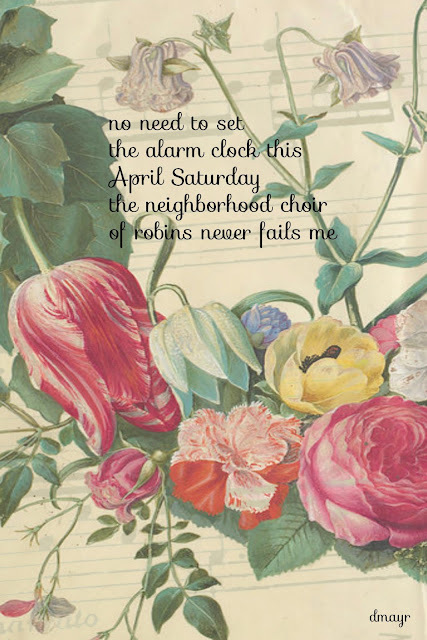 I love creating postcards myself and yours are just lovely-- a beautiful blend of poem and art. Thanks for sharing these and joining our Poetry Friday party this week! I'd love to see some postcard poetry exchanges this summer! I love the implied birds in the first one. Our new kitty LOVES open windows! I like your poetry, a wonderful cross-section of spring.